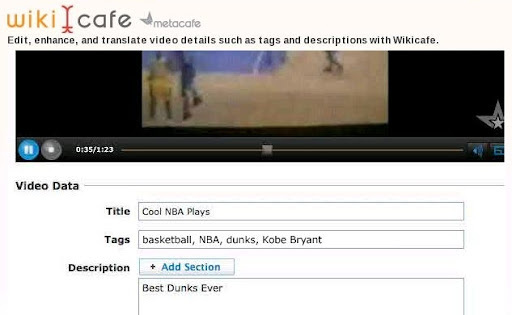 影音分享網站 MetaCafe 提出了一個有趣的實驗性計畫 : WikiCafe. 顧名思義 MetaCafe 希望把 Wiki System 目前在文字文件的成功模式複製到影像文件上, 不過 WikiCafe 現階段還僅止於把 Vedio Metadata 以及 Commentary 給 Wiki 化, 把 Vedio Tagging 的修改權力從 Vedio 分享者擴張到整個 Community. 首要的考量當然會是 Metadata Quality 的問題, 在 Marshall 的文章中也提到 MetaCafe 的 Community 整體素質比起 YouTube 來的高, 因此計畫成功的可能性也比較高. 不過我懷疑 MetaCafe 的 Community 素質高跟他目前的主要使用者族群有關, 如果 MetaCafe 的使用者族群分佈跟 YouTube 趨近的話, Community 素質是否還能維持就很難說了. 因此管理制度還是很重要的, 即便是 Wikipedia 也免不了面對此問題. 在爭議性高的議題上, 例如中國與台灣主權的問題, Wikipedia 也相當依賴頁面管理者仲裁, 甚至暫停管制該頁面的自由更新. MetaCafe 是否能複製 Wikipedia 的成功, Community 自身的管理制度我想會是成敗關鍵. 而在 Marshall 的文章中也提到另外一個 Versioning 的問題. 純論 Metadata 的 Versioning 問題, 也跟上述的管理制度有關, 同時我想透過 Wiki-like 的方式解決應該沒有甚麼問題. 會有問題的可能是 (1) Vedio 本身的 Versioning 問題, 以及 (2) Vedio 與 Metadata 之間的 Versioning 問題. 同樣的, Vedio 與 Metadata 之間的 Versioning 問題也來自對於原本 Vedio 所進行的修改. 在 Vedio 經過修改之後, 原本的 Commentary 是否還適用呢 ? 是否所有經過修改的 Vedio 都必須被視為新的 Vedio, 無法跟之前的 Commentary 拉上關係呢 ? 到目前為止好像沒有看到哪家 YouTube-like Website 針對這個問題提供管理服務. 不過解決方法其實已經具雛型了. 在 André Santanche 的 Fluid Web  中其實就說明了類似的模型, 以及對於 Versioning 的解決方案. 如果可以被成功用上的話, 應該可以大幅降低 Versioning 管理的 Cost. This entry was posted on 下午11:33 and is filed under data and knowledge engineering , web engineering . You can follow any responses to this entry through the RSS 2.0 feed. You can leave a response, or trackback from your own site.